Skipper Tackling Marlene. 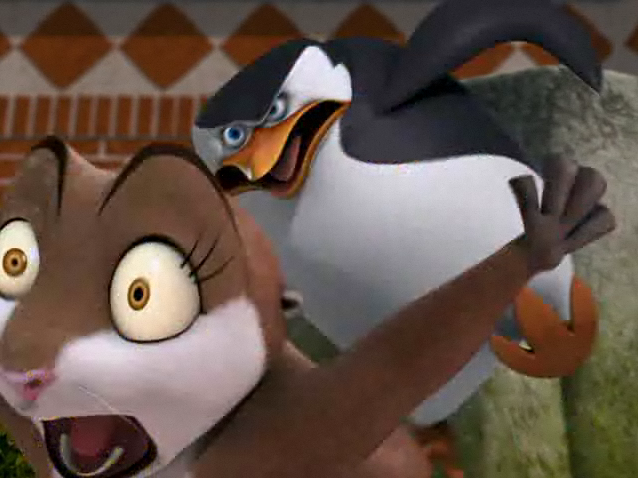 XD Her expression is priceless, no?. Wallpaper and background images in the पेंग्विन्स ऑफ मॅडगास्कर club tagged: skipper marlene. Nice job Skipper! I salute you! OMG, is this photo-shopped? Cause that is REALLY good editing, lol. God, that looks so disturbing, yet hilarious at the same time. L....O.....L...XD Not the most flattering photo of Marlene. 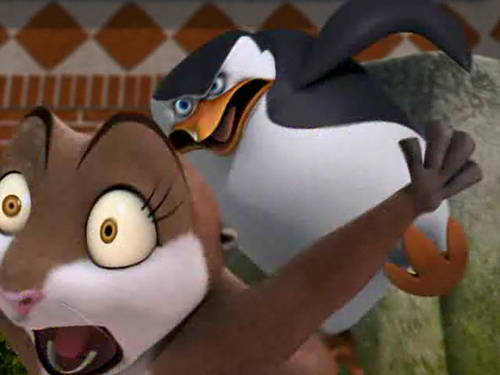 I can't believe Skipper actually thought she was in alliance with the red squirl! Someone HAS to draw this!!! Yeah Skipper! execute the pain on the Red Squirrel's contacts and inside men! Marlene's face = TOTAL WIN. And tomorrow they'll be back to playing chess together. They certainly have an interesting relationship. @penguinlover13- LOL! No it's not photoshopped! I was watching the Red Squirrel with my brothers and we were pausing it repeatedly to get funny pictures. I never knew it was Skipper who tackled Marlene. XD The whole thing lasts less than a second. So many things going through my mind.... .__. Skipper just invented Extreme Tag. By the way, this picture is hilarious! What an epic screenshot! It looks like he's tring to save Marlene from som one. @SJF: I freaking know, right?